All plants and animals have life cycles, a series of changes they go through over their lifetime. Everything begins life as cells with genetic information from the mother (egg) and father (sperm) of the same species. These cells combine to form a living thing that grows up and eventually dies. For some organisms (like humans), this process is slow and the changes between stages of the life cycle are gradual. In other cases, organisms completely change between one stage of their life cycle and the next. This is called metamorphosis. For example, a tadpole becoming a frog or a caterpillar becoming a butterfly are both examples of metamorphosis! It’s important to understand the life cycle of our pollinator species so we know what they need to grow up and reproduce. How does their life cycle compare with the cycles of other local pollinators? 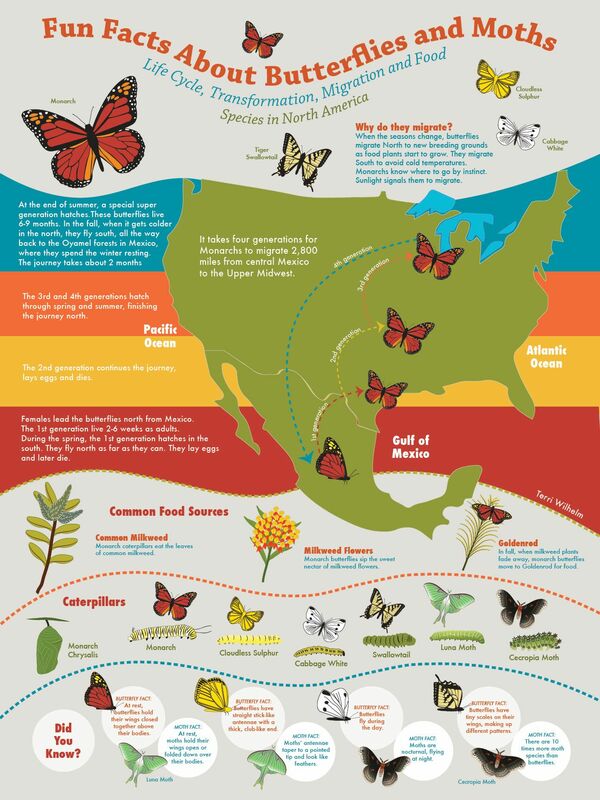 How does the need to migrate or hibernate affect some pollinators’ life cycles? How will understanding your pollinator’s life cycle affect how you help them? Butterflies, skippers, and moths are all related species (they are all members of the order Lepidoptera), so their life cycles are very similar. The life cycle of this group of animals is made up of four stages - egg, larva (caterpillars), pupa (a chrysalis for butterflies & skippers, a cocoon for a moth), and adult (butterfly, skipper, or moth). We call this cycle a complete metamorphosis because the physical form of the organism changes completely from stage to stage. Adult females of these species lay hundreds of eggs and use a special glue they create with their body to attach them to a leaf. She will purposely glue eggs to a leaf of the kind of plant that her young will need to eat when they hatch. The female might make that leaf smell a certain way so other females don’t lay their eggs on the same leaf or plant. The egg hatches into a small worm-like larvae called a caterpillar - and it’s hungry! The caterpillar eats the leaves of plants and grows quickly. It may grow to be 100 times bigger in just a few weeks! The food a caterpillar eats provides it with most of the energy it needs for the rest of its life. Once it has finished eating and growing, the caterpillar creates a velcro-like spot on a twig and sheds its skin to reveal a hard shell underneath. It is now in the pupa stage. Butterflies and skippers form a hard shell or chrysalis that hangs from the branch; moths form a silky cocoon to protect itself as it transforms. Inside the chrysalis or cocoon, a lot is changing! The caterpillar is growing wings, different kinds of legs and eyes, and a new mouth part -- it’s becoming a butterfly or moth! This stage usually takes a few weeks. When the transformation is complete, the shell peels back and an adult emerges. It spreads its wings and flies away. The main goal of the adult is to mate and find a good spot to lay a new batch of eggs. Most butterflies, skippers, and moths will complete this cycle and die in less than a year. Hummingbirds, like all bird species, begin life as embryos in a hard-shelled egg in a nest. The mother bird does all of the work to raise young birds. First, she builds a tiny nest about the size of a walnut shell. Then she lays a "clutch" of 2-3 tiny eggs that are only as big as a Tic-Tac. The mother bird will keep the eggs warm, or incubate them, for 10-15 days until they hatch. When they hatch, baby hummingbirds or hatchlings are very small. They weigh less than a gram (lighter than a single paperclip) and they're HUNGRY. The mother hummingbird spends a lot of her time catching bugs to feed her babies during this phase. Hummingbirds usually learn to fly by the time they're 21 days old. A female might have as many as three clutches of baby birds in a year. Many hummingbirds don’t survive their first year of life, usually because they don’t eat enough, they are hunted, or they get injured. Those that do survive can live 3-5 years. Bats are mammals, which means mothers give birth to live young and nurse them with milk. Bats are one of the slowest reproducing mammals on Earth for their size, giving birth to only 1-2 pups per year. Bats mate in the fall, usually in their southern habitats in Mexico. In the spring, pregnant females migrate north into the southwestern region of the US to eat from the cacti and agaves that are starting to bloom. After the females migrate north, they give birth to a live pup that is roughly a quarter of their size. The pups feed on milk until they are old enough to fly and eat on their own. The female bats in the colony work together to raise the young bats. Once the weather starts to get colder in the fall, the bats will fly back to Mexico to spend the winter and start the cycle over again. Bats can live for a relatively long time, as long as ten years. This is because they are active at night and live in the tops of caves, which reduces their risk of being attacked or hunted. Social bees live together in colonies, and these colonies only last from early spring to late fall. The life cycle of a colony of bees begins in early to mid spring when the pregnant queen bee awakens from her hibernation in the soil where she slept all winter, living off of her fat stores. Once she digs out, she finds an ideal sheltered spot to build a new nest, then starts collecting pollen and nectar. She secretes pollen and wax from her body and uses it to build a little nest, where she lays her first batch of eggs. The queen keeps the eggs warm by buzzing her body until they hatch into larvae about four days later. The larvae eat the nectar and grow until they are strong enough to produce a cocoon and pupate. They go through metamorphosis inside the cocoon and emerge as young bees about 14 days later. All of the bees in this first batch are female ‘worker’ bees that will do most of the work - they guard and clean the nest, and gather pollen and nectar to feed the colony. The queen bee’s job is to keep laying batches of eggs to build up the colony. Eventually, the colony has enough worker bees. At that point, new queen bees and male bees are produced to ensure the colony can reproduce the next spring. The new queen bees fly away to find mates and start the process of building a new colony. Males fly away to find queens to mate with -- but most never mate. As the weather gets colder, most bees die. Only the queen bee who has been fattening up on nectar and pollen survives by burrowing into the ground to hibernate for the winter. She waits there until spring to start the cycle over again. Solitary bees emerge in the spring when their host flowers are blooming. After mating, the female creates a nest either in the ground or in a hole in a tree or plant. She gets the nest ready for laying eggs and the development of the larvae by creating brooding chambers. The surfaces of these chambers are coated in a waxy substance and the female builds a pollen ball for the baby bee to eat once it hatches. Once it’s ready, the female bee lays one egg on the ball of pollen and then seals up the brooding chamber. After a few days, the egg hatches. Whether the egg hatches as a male or female is determined by whether it is fertilized. Males hatch from unfertilized eggs and females from fertilized eggs. The larva that emerges eats the pollen ball, then enters its pupal stage, where it spends the next several months going through its metamorphosis to become an adult bee. In the spring, the adult bee will finally emerge from the nest ready to feed, mate, and continue the cycle. Solitary bees live for about a year, although only 3-4 weeks of that life span is spent outside of their nest. How would you describe the life cycle of your pollinator? What role does your species play in the food and energy web?